As a coordinator with ACTWID-Kongadzem (a non-governmental, non-denominational and non-profit-making organisation) I am going to COP17 (the ‘Conference of Parties’) in Durban to represent rural Cameroonian women’s views on climate change and what we need to change to farm sustainably. Agriculture as practiced by rural women in the north-west region of Cameroon is currently based on the ‘slash and burn’ method. ‘Slash and burn’ is an indigenous method of farming that our parents have been practicing from time immemorial – whereby grass is cut, covered with soil and burnt. Farmers use this method, commonly referred to as ‘ankara’, to get a better yield of crops like cocoyam and egusi (melon seeds), among others as the ash fertilises the soil. But when the soil is burnt, its nutrients are destroyed and the soil is exhausted. 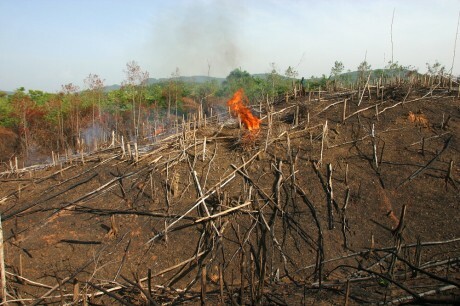 And, when the grass is burnt, it releases carbon dioxide into the atmosphere thus contributing to the depletion of the ozone layer and to climate change. We environmentalists know the threat posed by climate change and we also know that burnt, ‘sick’ soil anywhere means sick people. One can only imagine what will happen to the northwest region in particular where more than 96 per cent of farmers there practice slash and burn. Rural women understand that this technique is unsustainable and that the soils are already damaged from this farming method. But they say that for them to change, they need an affordable alternative. We think the alternative is to go back to nature. Therefore, we are launching the ‘Go Green Campaign’ in rural communities of Cameroon. This is a first step in adapting to climate change and avoiding climate crisis for all. The campaign’s message is telling small scale farmers that they can gather poultry waste and compost manure as fertiliser for the farms. This doesn’t require a lot of finances and minimises environmental damage. But there are problems. The waste and compost manure is not enough for all the farms and women also find that it’s a long procedure. Cameroon’s background is purely agrarian and many households survive on subsistence agriculture in our rural communities. In rural areas most farmers cultivate rain-fed agriculture as this is cheaper than irrigation technology. ‘Slash and burn’ is mostly practiced in the seven divisions of the northwest region where farming is the chief source of livelihood. Western, south-western and northern parts of Cameroon are the same. This issue is so important for the country. I am hoping to return to Cameroon from COP17 with practical and concrete plans of action for the rural women of Cameroon that I defend. Climate experts have been trying to get this message across at the past sixteen conferences. Importantly, this one in Durban, South Africa, will be the first COP in held in Africa. The women of Cameroon need to have to their dreams come true. Wendi Bernadette Losha coordinates ACTWID-Kongadzem, a rural women’s group from Cameroon and is currently in Durban at COP17 to represent their interests. Before leaving for Durban she explained to Leocadia Bongben why ‘slash and burn’ farming techniques are bad for both local agriculture and the environment and why the Durban conference must provide alternatives for small scale farmers.